It turns out that many antivirus engines white list authenticode signed binaries regardless of the trustworthiness of the signature. Here's an experiment that I performed, feel free to play along at home (remember to be careful when working with malware). This was actually the most time consuming step, a lot of places talk about malware and offer large archives of malware samples to download. Even so, it took me a good 15 minutes to find a malicious windows executable that I could download from a site without a password, registration or other nonsense. In the end I found a site that lists live drive by download sites and I grabbed an EXE before the particular malware host went down. Sadly I can't find the link to the index site I was using, I'm sure a little bit of Googling will allow you to retrace my steps. For this to work you need to know that your malware sample is detected by antivirus engines so I recommend submitting it to VirusTotal or similar service. Alternative if you have the resources run it against your local battery of antivirus installs. 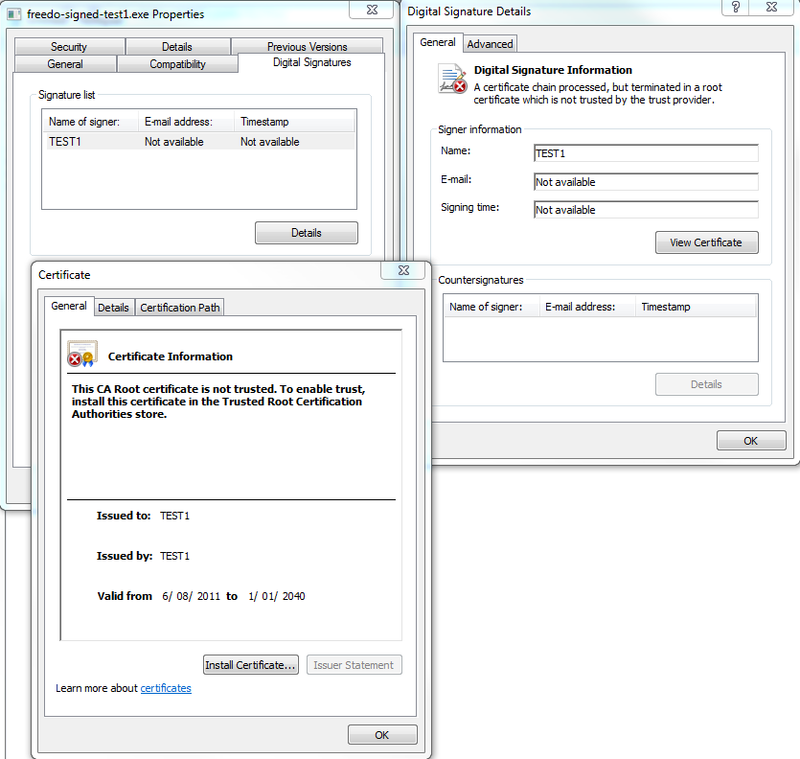 Freedom.exe was detected under a variety of names, Microsoft Security Essentials calls it Trojan:Win32/Danginex. The results were 36/43 (83.7%) considered Freedom.exe malware. Copy the sample to a new filename and then use signtool.exe to add the authenticode signature saying that TEST1 is responsible for this file. Submit your new file to VirusTotal and see what happens. In the case of Freedom.exe the detection rate fell from 83.7% to 27.9% (12/43). Most of the big names in the AV community (with a couple of notable exceptions) were quite happy to ignore Freedom.exe once it had been signed. Notably Kaspersky flagged both the original and modified samples as Trojan-Clicker.Win32.Agent.shx and ClamAV among 7 others did not flag either sample. Conclusion: What have we learnt? 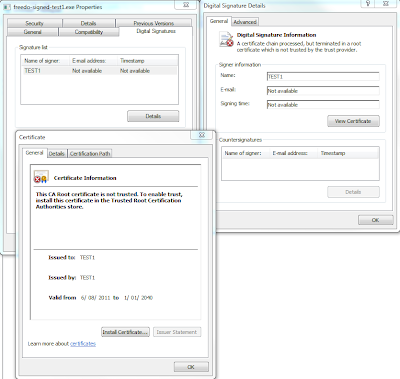 Signed executables are more likely to be considered benign by antivirus engines. Signed executables are probably excluded by policy for performance reasons but it is possible (but unlikely) that instead that the addition of the Authenticode block at the end of the file is disrupting the signatures used by the engines. I hope that in the future that if vendors are going to exclude signed binaries that they at least check to see if the certificate used to sign the binary is trusted.